Go to the registration page and get a license key for FREE. Build in CD/DVD burner software, no need for 3 party burner software. Supports CD-R, CD-RW, DVD-R, DVD+R, DVD-RW, DVD+RW and DVD-RAM. Allows splitting of large files (up to 4GB) over more CDs, files, etc. Drive Spanning, use of more than one destination or CD/DVD drives. Email notification with detailed reports of backup jobs. Spans multiple removable medias, such as CD's, DVDs, Zip drives, etc. Splitting of backup files for later writing to removable media. Incremental and differential backups using archive bit or catalog. Backup file naming with date and time for easy file management. File filtering to allow inclusion or exclusion of files by file type. Inclusion or exclusion of individual folders and files. 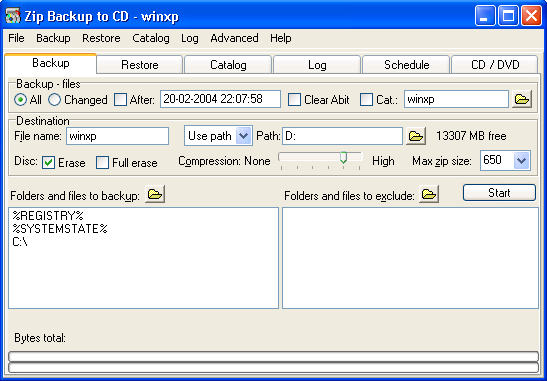 Restore your data without Zip Backup to CD. Windows� XP can read Zip file. A wide array of supported CD/DVD drives, test if yours is supported. Automatically compare after backup and burning to CD/DVD. Password protection for your backup files. Catalog system to manage your backup files and easy retrieval of files. Our backup software has its own scheduler supporting unattended auto-backup and scheduling of any specific Time or Date, Day of the week or Month. It also has command-line support for further automatisation. We believe you should be able to try a product before you choose to buy it. That is why you can download Zip Backup to CD and try it free for 30 days. There are no limitations, you get the entire product. Download a free trial immediately!